Set 1 Holy Resistance. The first time the Illusionist uses an Elemental: Holy ability per battle apply a +25% situational modifier. On a Critical deal an additional [(5 + 5 x Tier) x MAG + d8] magical Holy damage, rather than +100%. Set 2 Shadow Resistance. The first time the Illusionist uses an Elemental: Shadow ability per battle apply a +25% situational modifier. On a Critical deal an additional [(5 + 5 x Tier) x MAG + d8] magical Shadow damage, rather than +100%. Deluge deals (8 x MAG + d8) magical Water damage to the entire enemy party. Freezeblink deals (8 x MAG + d8) magical Ice damage to the entire enemy party. When Magic Frenzy is used, select a Spell to use. After the Spell's effects have been resolved, perform a basic attack (even if under the effects of Pain) upon the Spell's target. Prominence deals (8 x MAG + d8) magical Fire damage to the entire enemy party. Soil Evidence deals (8 x MAG + d8) magical ground based damage to the entire enemy party. Adjustment: +35 MP, +8 Power per tier above 1. 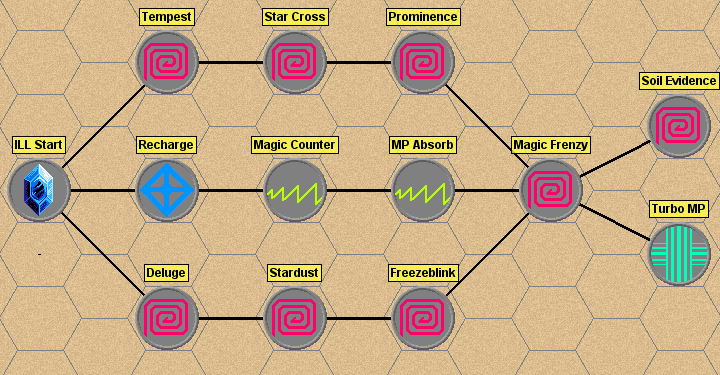 Star Cross deals (8 x MAG + d8) magical Holy damage to the entire enemy party. Stardust deals (8 x MAG + d8) magical Shadow damage to the entire enemy party. Restores (6 x MAG + d8) MP to the Illusionist. Adjustment: +2 MP, +3 Power per tier above 1. Tempest deals (8 x MAG + d8) magical Lightning damage to the entire enemy party. Trigger: The Illusionist is hit by a spell which deals damage and/or inflicts a negative status or effect. The Illusionist has a chance to absorb the energy used on the spell that hit him. MP Absorb grants the Illusionist MP equal to the MP cost.